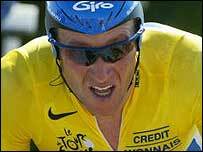 Lance Armstrong is poised to claim his fifth Tour de France crown after extending his overall lead in Saturday's dramatic time trial. The American leads second-placed Jan Ullrich by 76 seconds with just one stage left after starting the day 65 seconds ahead of his main rival. Britain's David Millar won the 49km stage between Pornic and Nantes, somehow clocking a time of 54 minutes 5.13 seconds despite crashing. But the main focus of attention was on the duel between the race's top two riders. Ullrich's hopes of making up time on Armstrong evaporated when he also crashed heavily midway through the stage. With rain and wind making conditions treacherous, the German fell as he rounded a corner, sliding into bollards at the side of the road. 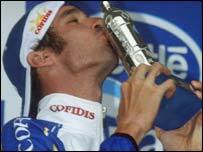 He picked himself up but suffered another wobble moments later before coming home in fourth place. "When I heard that Ullrich had fallen I did not take any risks," said Armstrong. "I took it slowly, slowly because winning the stage was not important." Armstrong eventually finished third, failing to win the final time trial of the Tour for the first time since 1999, with Tyler Hamilton claiming second spot, 14 seconds behind Millar. With just one stage left, the easy 152-km stage from Ville d'Avray to Paris, Armstrong just has to stay out of trouble on the final day to claim yet another Tour title. Millar's victory ensured the Scotsman's disappointing Tour ended on a positive note. "It was an absolute ice rink for the last 10kms," he said. "My wheels just slid - I was going so slow but it is incredibly dangerous." "Armstrong knows his ride has won him a fifth title"
"The last 15km are like an ice rink"
Who is the star of this year's Tour de France?